Welcome to another Feminist Friday! That time of the week when we get to depart from our regular content programming and highlight some of our fave videos of the moment. This week we’re all about triumph over adversity, and each of the videos we’re sharing perfectly fit under this idea. Our first video this week is a trailer for the upcoming feature documentary titled ‘The Most Dangerous Year’, from filmmaker Vlada Knowlton. In early 2016, when a wave of anti-transgender “bathroom bills” began sweeping across the nation, The Human Rights Campaign published a report identifying 2016 as the most dangerous year for transgender Americans. In Washington State alone, six such “bathroom bills” were introduced in the State Legislature. Filmmaker Vlada Knowlton captured the ensuing civil rights battle from the perspective of a group of embattled parents as they banded together to fight a deluge of proposed laws that would strip away the rights of their young transgender children. With the help of a coalition of state lawmakers and civil rights activists, these families embarked on an uncharted journey of fighting to protect and preserve their children’s human rights and freedoms in this present-day civil rights movement. As one of these parents, Knowlton presents an intimate portrait of her own struggle to protect her 5-year-old transgender daughter from laws inspired by hate and fear. From tension-filled Senate hearings in Olympia to intimate household settings of the families involved; from thought provoking conversations with key lawmakers to elucidating facts explained by leading scientists, ‘The Most Dangerous Year’ explores the transgender civil rights battle in all its richness and complexity. 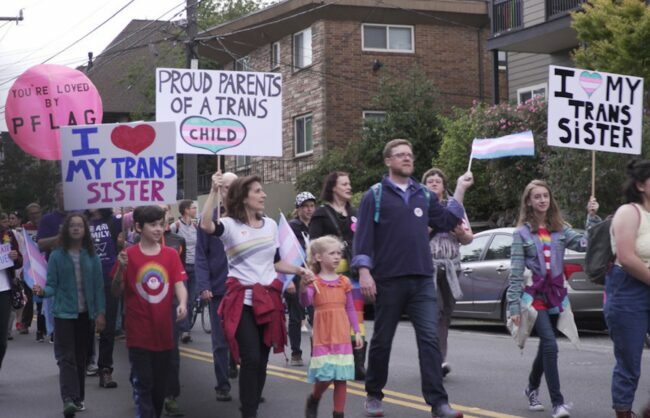 While the film follows the story and outcome of anti-transgender legislation in Washington, the heart of the film lies in the stories of the families who made the decision to accept and support their kids for exactly who they are. The second video this week is the first episode in a new web series for Ellentube, called ‘DiversiTea’, hosted by activist and the teen who spoke powerfully at the 2018 March For Our Lives event, Naomi Wadler. As a youth who has become passionately outspoken about the American epidemic of gun violence after the tragic Parkland school shooting in Florida in 2018, Naomi is no stranger to tragedy. But as a teen, she is also part of the movement of youth that are rising to the occasion and leading the way for change. In this first episode, Naomi had the opportunity to speak with one of her role models, tennis champion Serena Williams, whose family has also experienced the tragedy of gun violence when her sister Yetunde Price was murdered on Sept. 14, 2003 while in the passenger seat of a car being driven by Rolland Wormley, her partner. The two also talked about the ways gun violence affects African-American communities in ways that often goes unnoticed. “I was affected personally by gun violence, my sister unfortunately passed from that. People are talking about it now because it’s happening more widespread. But it’s been affecting our community for years,” said Serena. “I think we need to get comfortable with having uncomfortable conversations. Situations are never really gonna get better if you always avoid it, you have to take it head on,” the tennis ace added. Watch the episode below, and head over to Ellentube where you can also watch episode 2 featuring ‘The Good Place’ star Jameela Jamil. The final video this week is a positive and uplifting reminder that despite the difficulties, you can succeed and triumph over the odds. Country music singer Jennifer Nettles from Sugarland released this amazing music video for her track ‘I Can Do Hard Things’, and she told People.com the mission and reason behind it. “In the second verse, I talk about becoming a mother and what a major learning curve that was. I say in that verse, ‘I’ve gained joy that I’ve never learned but lost the lightness of when I was a girl,’ and that is because you have two hearts. You’re heavier when you are carrying around an extra heart that you are responsible for,” she explained about her own journey. The video, featuring 8 women who get to share their own stories of triumph, is ultimately a call-to-action to inspire others not to give up, especially when it comes to parents teaching their kids about adversity. “Love is most important and love is never wrong. As parents we want to shield our children from all the hard things, and the reality is we are not going to be able to. We can teach them they can go through the fire and that they have the strengths and the skills to do the hard things when they come up,” she said. -Jamie Combs: A former business owner and stylist, she’s an advocate for the transgender community, as well as a wife, mother and grandmother. -Morgan Leigh Garner: A singer/songwriter, mother and Army wife. She is raising her family, chasing her music dreams and holding down the home front as her husband serves our country as a Special Forces Solider. -Kate Davis: A photographer who also works as a Chief of Staff for an actress/activist, she’s adopting a baby as a proud single woman. -Audrey Ynigez-Gutierrez: A graduate research assistant, she is a care-giver to her disabled mother. -Holly Gleason: Journalist and consultant, she has spent the last two years quietly battling the profound aftermath of a Me Too sexual assault. -Ali Harnell: A high level career concert and event promoter, she has been chosen as the President of Live Nation’s Woman Nation to empower women in the entertainment industry. -Danielle Randolph: An active firefighter and member of the National Guard, she challenges perceptions of women in male-dominated industries. -Caroline Randall Williams: Award-winning poet, performance artist and food writer, creating art that tells the untold stories of women of color in her life and in the world.